The clean lines and the minimalist design of the Arper Catifa 46 swivel chairs create style and individuality in every environment, whilst offering the user the greatest possible comfort. 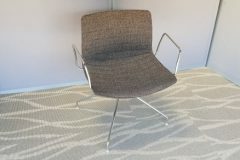 The ribbed back seat sits on a chrome 4 star swivel base and will add understated style to any workspace. 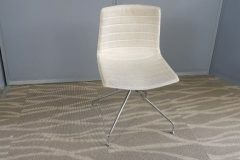 We have 4 dark grey, 6 mid grey and 4 light grey armed chairs, as well as 7 light grey armless chairs. If you would like to purchase these products, please get in touch with one of our sales team by calling 07944 508282, or you can fill out our Request a Quote Online Form. Alternatively, if you are viewing our website using a Mobile Device, you can click on the Telephone Icon located at the bottom of the page. 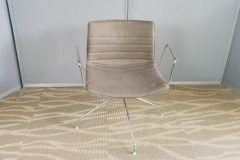 If you are unable to find what you are looking for, why not take a look at the other reception chairs we have in stock by clicking on the link provided. 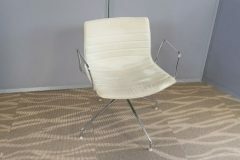 As always, these chairs can be viewed in our showroom along with all our other used office furniture.